Graphite heater, consisting of a bow-tie shaped graphite plate with 1 mm thickness and narrow neck measuring about 14 mm wide and 20 mm long. 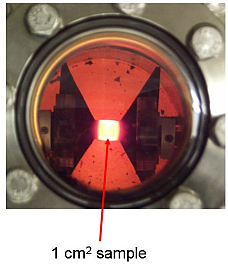 A 1 cm x 1 cm sample rests on this narrow strip, and is heated by currents of typically 200 A passed through the strip. Water-cooled copper clamps and electrical feedthroughs supply the current, and the heater is contained in an ultra-high-vacuum chamber.